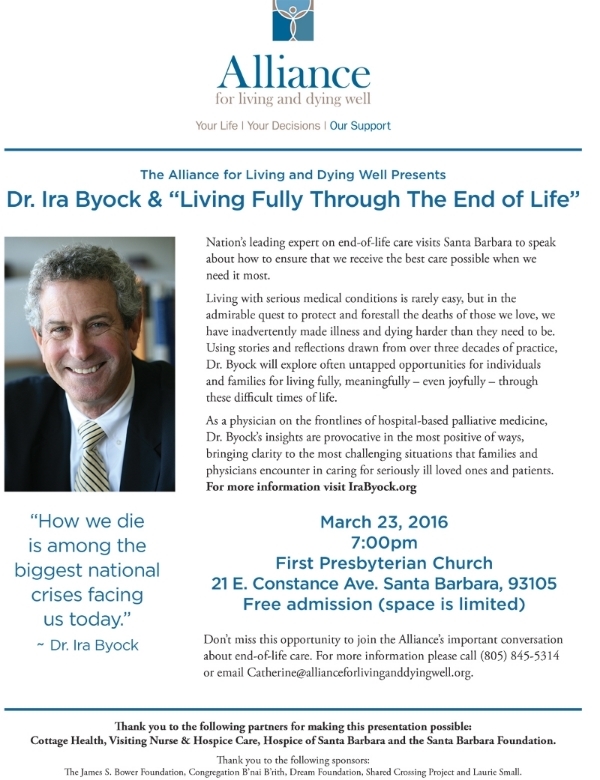 The nation’s leading expert on end-of-life care, Dr. Ira Byock, will present his lecture “Living Fully Through the End of Life” at 7 p.m. March 23. Presented by the Alliance for Living and Dying Well, the lecture will be held at First Presbyterian Church -- 21 E. Constance Ave. Santa Barbara, 93105 – and cover how to ensure we receive the best care possible when we need it most. Admission is free. Living with serious medical conditions is rarely easy, but in the admirable quest to protect and forestall the deaths of those we love, we have inadvertently made illness and dying harder than they need to be. Using stories and reflections drawn from over three decades of practice, Dr. Byock will explore often untapped opportunities for individuals and families for living fully, meaningfully – even joyfully – through these difficult times of life. Space is limited. For more information please call (805) 845-5314 or email Catherine@allianceforlivinganddyingwell.org.